Engagement. Data. Revenue. Customer loyalty. All of these are benefits to including a membership offering as part of your marketing, product and customer strategy. To help you do that, we explore the biggest challenges to growing membership in the latest marketing chart. Read on for data from Marketing General Incorporated along with analysis and tips based on the data. Free memberships can be part of a content marketing offering. Freemium memberships help drive app downloads and a customer base for paid offerings. And premium memberships may add secondary revenue or be the entire focus of your brand. For all of these, the “membership” and the product offering itself (say with SaaS products or digital media) might be quite similar. Whatever your strategy, to get ideas for launching or growing your membership, let’s take a look at the biggest challenges faced by a group that considers memberships to be core to organizational success — association executives. I came across this research as part of a literature review conducted by MECLABS Institute (parent research organization of MarketingSherpa) for a Research Partner. In January and February 2017, Marketing General Incorporated surveyed executives representing 1,005 unique associations. In the chart below, you can see the response from 775 associations to a question about the top three biggest internal challenges to growing membership. As you can see in the chart above, the top challenge to growing memberships was an element core to marketing (and all business endeavors) — the value proposition. More than a third (37%) of respondents said “difficulty in communicating value or benefits” was one of their biggest membership growth challenges. If you walk into a store and pick up a drill, a pair of sunglasses or any other product, there is a great tangibility to the product. You can touch and feel it. There are subtle psychological elements at play that signal to customers the product is worth paying for. Much of what memberships offer is intangible (with the exception of box-of-the-month type services). Memberships, in particular, online memberships, tend to focus on elements that have intangible value — discounts, content, access, shipping, advocacy work of the organization, etc. There are two ways to overcome this challenge of communicating the value of intangible benefits. First (and most fundamentally), make sure the product itself has a powerful value proposition, and that you message the value proposition effectively to ensure that intangible benefits of the product have a high perceived value. Another thing you can do is offer both tangible and intangible options. Ten Club, the fan organization for the rock band Pearl Jam, does this well. The club offers both a digital membership and an analog membership. The digital membership offers the traditional intangible value found in most memberships like exclusive content, discounts, and purchase opportunities. However, the analog membership offers tangible value in addition to intangible value. For example, while digital members receive a PDF magazine, analog members receive a hard copy of the magazine as well. Because of this additional perceived value, the club is able to charge twice as much for the analog membership than it does for the digital membership. This is what I call a value gulf, a large enough difference between the perceived value of two offerings to encourage enough of the ideal customer to upgrade. Research we conducted with 2,021 consumers provides a further example of the additional perceived value provided by tangibility. As you can see in the below chart from the MECLABS Newspaper Paywalls and Digital Subscriptions report, consumers see far greater worth in the tangible value of print magazines and print newspapers than digital magazines and digital newspapers. For example, consumers are 120% more likely to buy a print newspaper subscription/plan with recurring payments than a digital newspaper subscription/plan (22% of consumers vs. 10% of consumers). Unique value is, of course, an important element of the value proposition for every product. However, it is far more important for memberships than other products. Memberships often offer products that don’t necessarily feed an in-the-moment customer need in the same way. Take the Ten Club membership above. It must have a clearly and forcefully communicated unique value to encourage a purchase. A customer does not just happen to have the need it fills. In addition to creating unique value for the membership offering itself, a membership can borrow from the primary value proposition of the brand behind it and place the membership in a category the customer is already considering. This will mean your brand has already passed a trust trial with the customer, such as finding enough value in a freemium or free trial membership to internalize the value in purchasing a premium membership. Take Amazon’s Prime membership, for example. According to its SEC filing, “13 years post-launch, we have exceeded 100 million paid Prime members globally.” Amazon started as a membership by bundling a service with an annual fee that customers were paying for individually, while, of course, leveraging Amazon’s primary value proposition — shipping. Customers needed the category already when they were offered the membership. It has since grown by bundling additional categories into the membership that customers would otherwise pay for on an ad hoc basis — movies and TV shows, ebooks, cloud storage — in addition to discounts familiar to many memberships (with special Prime member deals at Whole Foods, for example). In cases where the category isn’t a default purchase or already valued, however, it is important to sell the value of the category. “A lot of brands are missing the mark on communicating value to their prospects by not acknowledging or accounting for the growing perception of content/information as a commodified resource,” said Danitza Dragovic, Digital Optimization Specialist, MECLABS Institute. Don’t confuse table stakes with the unique value necessary to sell a membership — because customers might (with their opinions, not their actions). In a survey of 900 US consumers (also from the MECLABS Newspaper Paywalls and Digital Subscriptions report I mentioned previously) we discovered that what customers think they value and what they actually do when choosing to be a subscriber are different. For example, when asked which news topics were essential, national news topped the list. 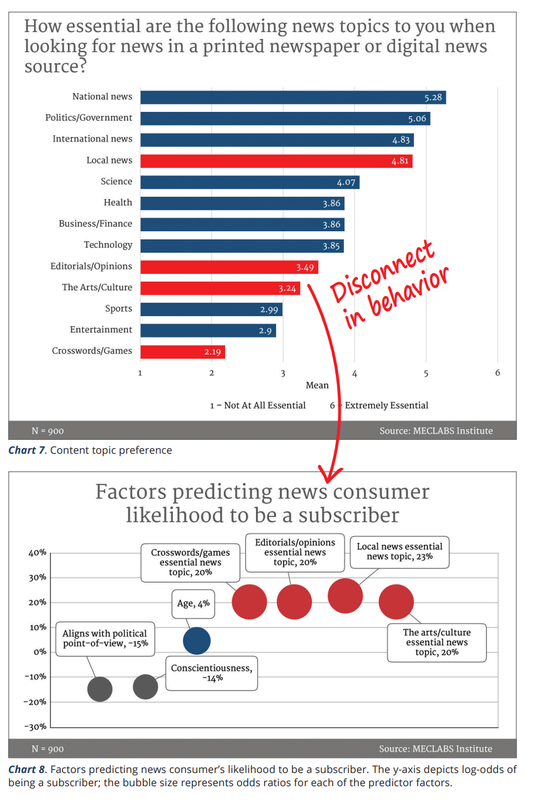 However, the biggest differentiator in subscriber propensity was actually local news. National news is “table stakes.” Its widespread availability makes it a commodified portion of a newspaper or digital news subscription/membership. However, quality local news coverage is much harder to find and provides much more unique value. For your membership offering, your ideal customer likely expects certain table stakes aspects of the membership. For example, customers may expect job listings in a digital career website free or paid membership. But that may not be enough value to get many to become members since they may perceive they can find that value elsewhere. So on top of that base commodified value, additional unique value must be added. “The digital revolution has redefined the way people relate to one another and consume content on the whole. A myriad of information and networking opportunities are instantly accessible, driving further audience fragmentation. It is increasingly important for brands to evaluate the exclusive value they can provide in membership offerings, and ensure that they can effectively communicate their value proposition to their prospective member base,” Dragovic said. It’s not always easy to tell which elements of value are table stakes, which offer unique value that will attract a customer to become a member and which have little value at all. To determine which to emphasize with your marketing (or from a product level, which actually have value to potential members and therefore should be part of the product offering itself), you can engage in value proposition experimentation. Consumer Reports conducted a test of a membership renewal email to discover more about the nonprofit organization’s value proposition. “Challenge what you think you know by doing very specific testing around messaging (first) and then presentation (second),” Dawn Nelson, Director, Fundraising, Consumer Reports, advised. “Test the boundaries to ensure there are very distinct differences in your messaging to allow you to really discern what is resonating and what definitely is not. You can learn as much from the ‘losers’ as you can from the ‘winners,’” Nelson said. Use data obtained from freemium membership registration to help communicate the value and benefits of a premium membership. There may be several different personas of potential members. You can use the data generated by a freemium membership to better deliver unique value most suited to their different needs and desires. 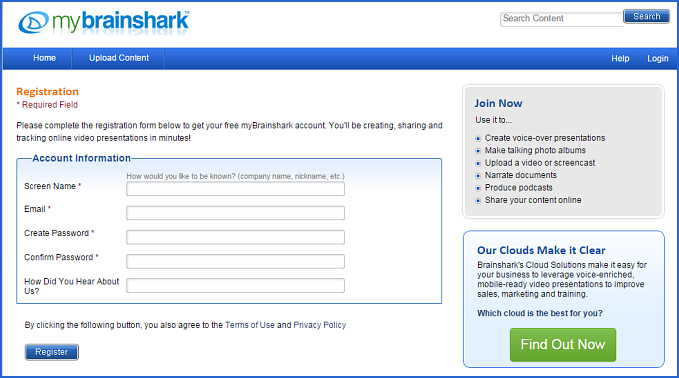 Brainshark’s freemium landing page offered clear benefits for customers who “joined now,” and the only information the company asked for was an email address. The cloud-based B2B service for training, sales conversions and marketing was ultimately looking to find customers for its enterprise version. The team used an IP lookup solution along with a second-visit form asking for more information to segment their freemium members and better target potential enterprise customers. “If you’re with an enterprise company, maybe you’re in the wrong place [within Brainshark’s marketing segments] — in marketing versus training versus sales. [With this knowledge] we can offer content to you that may be more relevant,” said Arthur Gehring, vice president of Demand Generation, Brainshark. While communicating value and benefits was the top challenge identified in the chart, there are other elements that affect the probability of conversion as well. Don’t overlook some basic elements like reducing friction. For example, a company was trying to upgrade free members to a paid subscription on an offer page. By combining the offer and payment page into one step, they were able to increase conversion 148%. Before we end, I should caution that memberships don’t only provide upside. There is a cost as well. By making the elements of your membership closed instead of open, you also reduce the virality of the membership group you’re building. For example, fewer people are likely to share an article behind a paywall on social media than an ungated article. MECLABS Institute Value Proposition Development online certification course — Learn how to identify value — and utilize it in an optimized value prop — based on proven research and discoveries from the MECLABS Institute team.